Fraser-Brunner A. 1955. A synopsis of the centropomid fishes of the subfamily Chandinae, with descriptions of a new genus and two new species. Bull. Raffles Mus. No. 25 (Dec. 1954). 185-213. Hamilton F. [Buchanan] 1822. An account of the fishes found in the river Ganges and its branches. Edinburgh & London. Fishes Ganges . i-vii + 1-405. Bleeker P. 1874. Révision des especes d'Ambassis et de Parambassis de l'Inde archipélagique. Natuurk. Verh. Holland. Maatsch. Wet. Haarlem (Ser. 3) v. 2 (no. 2). 83-106. Macleay W. 1883. 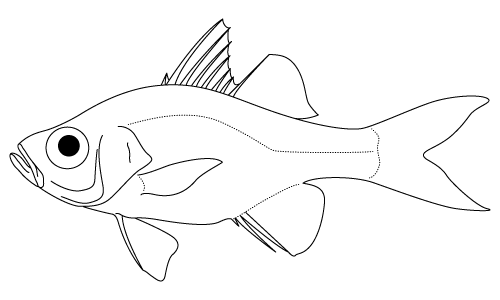 Contribution to a knowledge of the fishes of New Guinea, No. 4. Proc. Linn. Soc. N. S. W. v. 8 (pt 2). 252-280.